Was the longtime military man initiating a coup? No, but during a recent episode of The Americans, a new cable show about Soviet spies living in the US, that was precisely the concern. “He’s their top general,” was the basis for one of the main character’s worries. Leaving the question as to whether or not Russian spies lived among us in the 1980’s for another time, I did begin to wonder if this was truly a point of concern for Russian government. Was the United States on the verge of a military coup? Perhaps the post-Soviet Union collapse declassifications revealed those anxieties. If not, the idea isn’t too much of a stretch given their own history of autocratic reigns, Stalin’s rise to power and his dictatorial rule. Conceivably, America’s “top general” stating on television for all to see that he was in control was – from a foreign government’s perspective- just that, a coup to take over the US government. For me, this illustrated a tenuous comprehension of the succession of power laid out in the Constitution. Thinking on this I was reminded of a moment in Erik Larson’s In the Garden of Beasts, a story about the first American ambassador to Nazi Germany in 1933, where the German government took particular offense to a mock trial of Adolf Hitler scheduled to take place in New York City. They wanted the US State Department to put a stop to this trial due to “…its lamentable effect on German public opinion if it should take place.” The State Department official responded that it was a public gathering and given the “guarantees of freedom of expression” provided by the US Constitution there was nothing to be done. Germany’s officials “seemed utterly unable to grasp” this concept, the broad freedoms accorded to the public nor the restrictions placed on government. These examples are emblematic of the inherent misunderstandings of the US Constitution’s core inflexibility. That inflexibility, through a stringently abided by, detailed succession of power, is a proven deterrent against one person or group consolidating power and essentially effecting a government takeover, as Stalin did in Russia. Embedded also within that core is an unwavering freedom of expression which cannot be infringed. 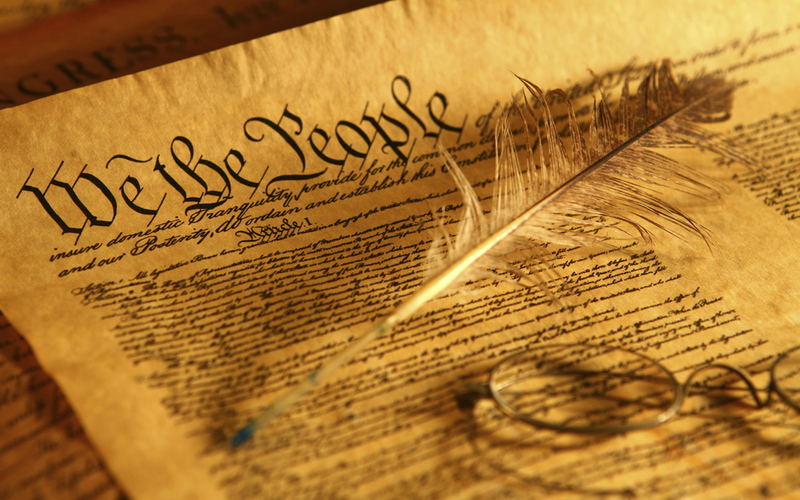 The US Constitution has shared its two and a quarter centuries with roughly 900 other, short-lived constitutions. On average its contemporaries were in existence no more than 20 years. According to the Comparative Constitutions Project, a joint endeavor between the universities of Chicago and Texas, constitutions are, “very fragile things”. The two nations of Haiti and Dominican Republic who share the island of Hispanola, have shuffled through 63 written constitutions all by themselves. The project’s findings suggest specifics matter. The more detailed a constitution is, the longer it will last. The authors concluded it’s the investment in ironing out the controversial issues, the hard work to reach consensus that injects a lasting value into the document. While the freedom to institute its own government was hard fought and idealized overtime, the defining document by which the United States is led most certainly has its share of ambiguities. These persist still to this day, embodied in gun control debates, voting rights challenges and various issues of equality. We, as a country, continue to find new ways to debate the Founders’ true intent. Would there be less frequent battles over the same issues if the authors would have just been a little more specific? Perhaps, yes. While the framing document left a number of areas open for debate they were clear about many of the essential processes of government and the rights inherently bestowed upon the people. The unalterable lines of succession and separation of powers prevent government usurpers from managing a coup d’état. When Alexander Haig appeared in front of news cameras stating he was in control, there were reports of laughter in the Situation Room. The amusement inferred a particular level of security placed in the transfer of power detailed in the Constitution. And had Haig entertained any designs on such a grab for power he would not have progressed very far because of the limited ability to consolidate power. Unlike other countries, the military is not beholden to its generals. Members of the armed forces do not claim fealty to one general. They swear allegiance to the Constitution and to its defense. While the individual rights restrict change, in effect preserving them, the rights in of themselves can drive change to the Constitution, to address significant social issues like abolishing slavery, to clarify the rights of others by ensuring the right to vote for all citizens and to even correct mistakes or adapt to an evolving society illustrated by the repeal of prohibition and the shift to the direct election of senators. But what may well be the linchpin or key to the US Constitution’s success is not just that it serves as the cornerstone of our country but it’s also built upon the reverence attached to it. Unlike countries whose governing documents change with the proverbial wind, this veneration of the America’s constitution and its authors has created, in effect, an embodied loyalty akin to a religiousness by which all laws are judged. Perhaps therein lies the roots of the misunderstanding. This document is the last word on the public’s rights and the limits of government which is beyond reproach. While we are frequently caught up in semantics and heated debates over its interpretations it’s that reverence which in the end binds everything together. Half the American idiots screaming about their Constitutional rights have never read the document….their attention spans are custom made for The Kardashians…..not The U.S. Constitution. And there are those in Washington who are eagerly eroding away our rights guaranteed under the constitution. I’d argue that the Supreme Court is doing more to erode those rights than the other two branches. States are adding to that erosion through laws hindering voting rights, rights for equality and reproduction rights for women. All three branches are now in the pockets of the corporations, whereas in the past, it was just the two branches. I think the Supremes, particularly under Roberts, have done a great deal of damage to their image as impartial jurors, and are now as politicized as Congress and the White House.